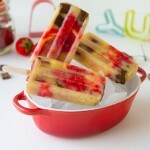 Vegan banana split popsicles made with banana puree, fresh cherries, chocolate chunks, pineapple and strawberry puree. If using a popsicle mold that requires wooden sticks, soak in cool water for 5 minutes before using. I used these popsicle molds. Place banana pieces and milk in a blender and blend until smooth. Pour into a glass with a spout and set aside. Place strawberry halves in the blender and pulse just until broken down but not smooth. Place into a dish and set aside. 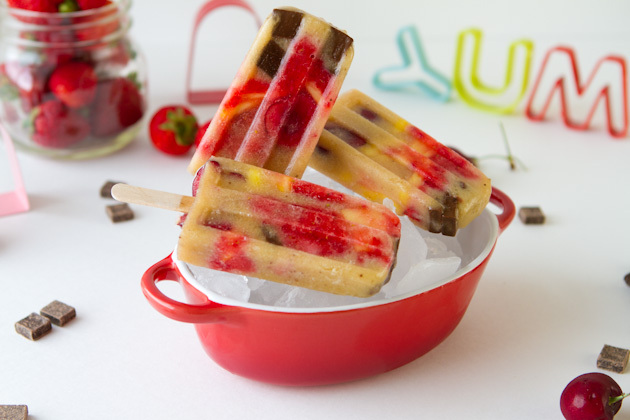 Get to layering your popsicles! Begin with a tablespoon or so of banana puree, followed by 4-5 chocolate chips, divide the pulsed strawberries between molds, top with diced pineapple and press the pineapple down slightly so that it’s flat in the mold. Follow this by 2 cherry halves, then top with remaining banana puree. Tap the popsicle mold on the counter a couple of times to release bubbles throughout the mold. Top with additional banana puree if needed. Slide the soaked sticks into the prepared molds and stick in the freezer for at least 12 hours or better yet, overnight. To remove popsicles, run molds under hot water for a couple of seconds and wiggle out.